There are growing national and global policy focuses as well as local concerns about lifelong learning, particularly as it pertains to working life. Yet, at the commencement of this book, it is important to capture some key precepts through what comprises these concerns and how they can be understood and addressed. 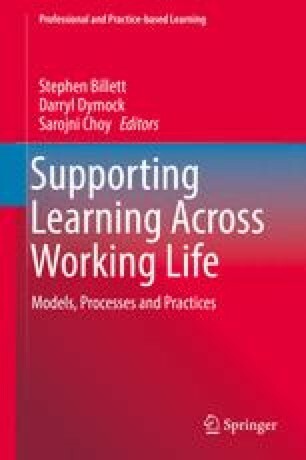 These include being clear about what this concept of learning for working life comprises, and the kinds of purposes to which that learning is held to be directed. This necessitates securing greater clarity about what are variously referred to as lifelong learning, lifelong education or learning across working life so they can be distinguished from each other, and their specific qualities and characteristics understood. Currently, the overall concern is about individuals’ learning across working life and how this can be effectively promoted and supported when addressing needs associated with sustaining their employability. Beyond resisting unemployment, employability includes workers developing and sustaining the kinds of capacities needed by their workplaces to remain viable as requirements of goods and services change, the industry sectors in which they work seeking to remain responsive to transforming demands and for the nations in which their citizens are to be competitive in the production of goods and services. In essence, these sets of personal, workplace, local and national lifelong learning imperatives arise from the realization that individuals’ initial occupational preparation will be insufficient to meet their needs for employability across lengthening working lives. The dynamic requirements for work mean that focused and sustained learning across working life is now required by all kinds of workers, occupations and industry sectors. Having defined some of the key concepts, discussed precepts and concerns, the purposes of intentional learning through and across working life are set out through considering both personal and institutional imperatives. Following this, consideration of approaches for organizing, ordering, supporting and guiding this intentional learning are advanced.